I love bread. I love eating it. I love making it. Heck, I even like smelling it. The only thing I do not like about making bread is the insane amount of time you have to wait for it to rise. These crescent rolls are the perfect answer to that problem. They still have to rise twice, but for only a total of 40 minutes. That is a huge improvement from the other breads that I have made that have required ~ 2 hours to rise! I was really impressed with how cute these turned out. 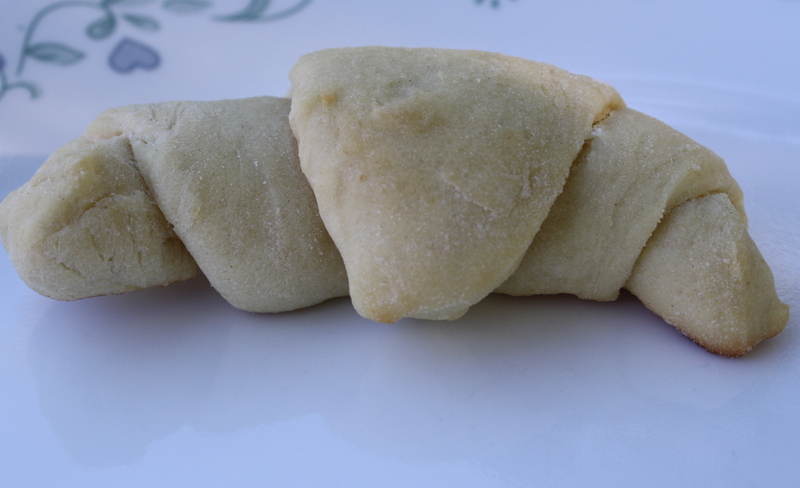 They actually looked like the crescent rolls from a can (I’ll admit – I usually use that kind). 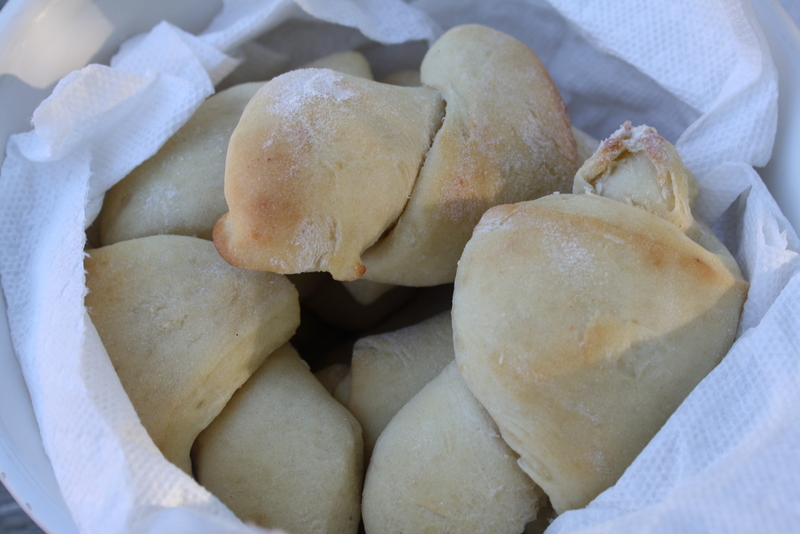 I halved the recipe when I made them, but it still only made about 10 rolls. I don’t know how they got 3 dozen out of twice what I made. Maybe mine were bigger than the ones that they made. I made these when I made dinner for my dad and Zack last weekend. See Whipped Sweet Potato Casserole and Grilled Citrus Chicken. They complemented both dishes really nicely. In a large bowl, combine 3 cups flour, sugar, yeast and salt. In a small saucepan, heat milk and oil to 120-130 degrees. Add to dry ingredients; beat just until moistened. Add eggs, beat until smooth. Stir in enough remaining flour to turn a soft dough (dough will be sticky). Turn onto a floured surface, knead until smooth and elastic, about 6-8 minutes. Cover and let rise for 10 minutes. Divide dough into thirds. Roll each portion into a 12-inch circle, brush with butter. Cut each circle into 12 wedges. Roll up wedges from the wide end and place point side down 2 inches apart on baking sheets coated with cooking spray. Curve ends to form crescents. Cover and let rise until nearly doubled, about 30 minutes. Bake at 400 degrees for 10-12 minutes or until golden brown. Remove from pans to wire racks. Sure, thank you for asking!